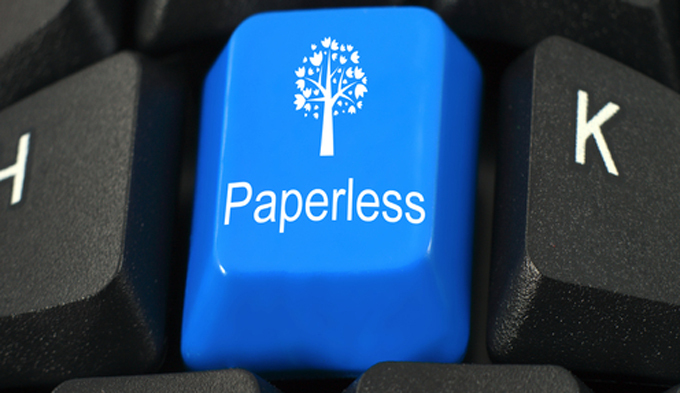 Why Should Corporates go PAPERLESS ! Saves Space: Imagine if every paper your company ever used was filed away? There wouldn’t be space to house your staff. Comparatively, a few hard disks which are stored as the backup of a server, for example, will effectively reduce the amount of space consumed by the paper. Use the remaining space however you wish! Easier to share: A lot of corporate these days use a main access server which allows every employee to log on and share data. Authorized personnel are given access to the server which allows you to access the files of your colleague who could perhaps be sitting a couple of floors away. It is the easiest way to share your company’s data among the employees. Even if you were to send the files to the clients email is very easily accessible thanks to the smart phone generation. Security: If a bunch of papers are filed away from prying eyes with a lock and key, they are still entirely accessible for those who want to access them. Going digital will help you govern who has access to what. You can hide the existence of certain sensitive data and with professional help maintain the secrecy and sensitivity of your information. Click of a button access: While looking for a document which has been filed away, the resultant time taken and therefore wasted is enormous. By going paperless, read digital, all the information is easily accessible to those who have the authority. A simple click of the button can take you to the document you are looking for. This can be especially useful for those organizations which are very client centric. While dealing with a client, real time service is always a bonus. Save money: At any level, an organization is always trying to cut costs. Printing, using and wasting paper can be the cause of a hole in your pocket. By going digital you by pass this process. Going digital requires a onetime investment with a minimal upkeep cost which can mostly be managed inside the organization. Multiple offices same quality: In today’s day, if you are looking to expand your organization or if you already have multiple branches, going digital can be a method of quality control for you. The digital platform will be the same across cities and nations which will keep, at least to a certain extent, the same level of quality. Operating cost: It has been noticed that paperless offices have more productivity as the technology is easier to use and wastes lesser time. The more time your employees spend actually working, the more the productivity is. Also, the process of handling hard copies is more time consuming- which means you pay your employees more for lesser amount of real work. Corporate Responsibility: Being a paperless organization can actually win you some bonus points in front of the environmentally fanatic organizations. It can also figure as a corporate responsibility initiative from your organization and maybe help you with your clients. Less Vulnerable to physical damage: Data which has been stored digitally stands a lesser chance of being lost than hard copies. If an unfortunate event like a fire were to take place in your organization, data worth many years would be instantly wiped out. Case in point, the recent fire at the Mantralaya. Going paperless is all the rage these days. More than just being a trend, going paperless as an organization entails a certain amount of responsibility as a part of society. And if it helps you in so many ways, why not?